It’s interesting to note that Jesus did not simply tell Peter and the Apostles to put out into the water; rather, He told them to put out into the “deep water.” This is significant. At the close of the great jubilee year of 2000, Saint Pope John Paul II wrote an apostolic letter, Novo Millennio Ineunte in which he began by quoting this Gospel passage. This passage set the tone for the rest of his letter in which he called for a new evangelization for the coming millennium. “Put out into the deep!” What should we take from this? What should we hear Jesus speaking to us? We should hear Him calling us to “lower our nets” in a tireless and committed way so as to draw many others to the Gospel. 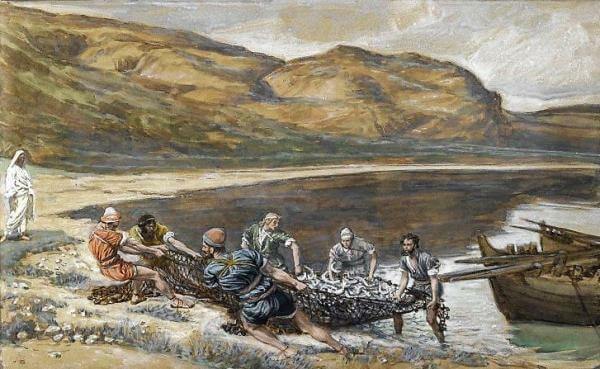 When Peter and the Apostles did this in the boat, they caught so many fish that their nets were tearing and they were greatly astonished. This is a prophetic action given to us to tell us that we must evangelize with the utmost enthusiasm and zeal, searching far and wide for God’s lost sheep. The world we live in can be brutal at times. So many people are lost and confused. Sin is rampant and despair is prevalent. Our world is in desperate need of a Savior and we are the ones Jesus desires to use to gather a huge catch and to find those in greatest need. Jesus desired the Apostles to catch the fish that were in the deep waters as a way of saying that there are countless souls in our world who are far from God. There are many people “swimming” in an ocean of confusion and pain. It is these people, in particular, that Jesus wants to draw in. It’s our responsibility to heed the command of our Lord and to seek them out. Reflect, today, upon these words of Jesus: “Put out into the deep water.” In what way is Jesus asking this of you? How is it that He is calling you to go out of your comfort zone and “lower your nets?” What is it that He wants of you and how does He desire to use you to further the mission of evangelization. Heed His command and you, too, will be amazed at the good fruit that is born! Lord, I desire to give myself to You for Your service and glory. I desire to go forth, at Your command, looking for the souls in most need of Your abundant mercy. Give me the grace I need to be faithful to the calling You have given to me so that Your loving mercy will reach those most in need. Jesus, I trust in You.